For this week, the first contest on jsB@nk is 5 free copies of Fiverr Force ebook, valued $32 for each. Fiverr Force is one 22-page ebook packed with information that help you make money online more effective and will increase your online earnings in as little as a day. You can start off making hundreds then make money fast and end up making thousands. 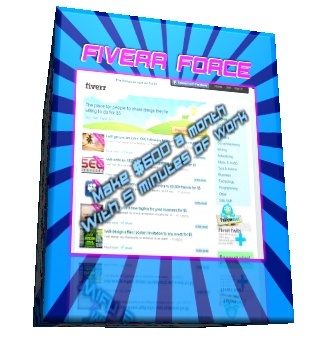 Fiverr Force is guaranteed to increase not only your Fiverr revenue but your online revenue in general. It will show you how to make hundreds of dollars each month by putting in only 5 minutes of work a day! No joke! Just see the features below then read what others had to say about Fiverr Force. You can easily turn Fiverr into a main source of income for yourself by reading this report and putting it into action. This is THE opportunity. Don't miss out! No idea what to sell? -You also get a LOAD of gig ideas and how to create these gigs to make them sell! 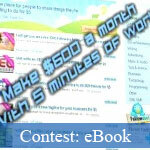 This contest ends on October 14, 2010; then 5 commentors will be choosen to give away the prizes by a random SQL query. The winners will be announced on a separate post, so stay connected us via RSS feed to see if you're a luck man! Fiverr is a nice place to meet buyers and sellers. It is a wonderful marketplace where you can get all sorts of work done at only $5. On the other hand, you can earn some money if you have got the necessary skills. I think this Ebook is helpful but the owner should have gruanted money back if the customer don't like this ebook. I think this ebook will hit it up. I would also like to mention that another good website like fiiverr is fivers world. Low Fee, Low threshold.